Abstract: There are close similarities between the Brunovistulian Terrane and the Istanbul Zone both in the Neoproterozoic and Paleozoic. The geological structure, lithology and geochronology of the Cadomian Brunovistulicum show broad fit with the crystalline basement of the Istanbul Zone. Their Gondwana or Baltica affinity is still poorly constrained and remains a matter of discussion. The Vendian and Cambrian sequences recognized in the central Malopolska, Brunovistulian and Moesian terranes correlate well with the Scythian Platform. In the Istanbul Zone the presence of the pre-Ordovician sedimentary sequences has not been confirmed and may only be anticipated. In the Paleozoic the best fit was attained in the Devonian–Carboniferous interval. The sedimentary record in the Zonguldak and Istanbul Terranes closely compares to the Moravian Karst and Ludmirov facies developments of the Brunovistulian Terrane. The correlation is reinforced by a good fit of the main Variscan deformation phases attributed both in the Brunovistulian Terrane and the Istanbul Zone to the late Visean–early Namurian and Westphalian–Stephanian intervals. This supports, together with the paleobiogeographic data, the interpretation that the Istanbul and Zonguldak Terranes can be regarded as counterparts of the Rhenohercynian and Subvariscan Zone in Central Europe. The Istanbul Zone is juxtaposed against the Sakarya Zone viewed as a part of the Armorican Terrane Assemblage. Abstract: The kinematic similarities of small-scale structures in the Rhenohercynian Zone and the external zones of the Hellenides are illustrated. Both orogenic domains comprise asymmetric folds verging toward the foreland and are affected by extensional joints (ac and bc) associated with hybrid joints as well as with shear fractures (hk0a and hk0b). Joints were formed during layer bending which took place throughout the fold evolution and were symmetrically arranged with respect to principal stresses σ1, σ2 and σ3. Although the magnitude of the stress axes changed during folding, their orientation with respect to layering remained constant: one of them is orientated perpendicular to the layering, whereas the other two are parallel and perpendicular to the dip direction of the layering respectively. As expressed by ac and hybrid joints the extension normal to the dip direction of layering progressively increased during fold tightening. Layer parallel shear responsible for the asymmetry of the folds caused joint rotation toward the fold hinge within the long limb. Furthermore, these movements controlled at both limbs the formation of bc and associated hybrid joints during the folding. 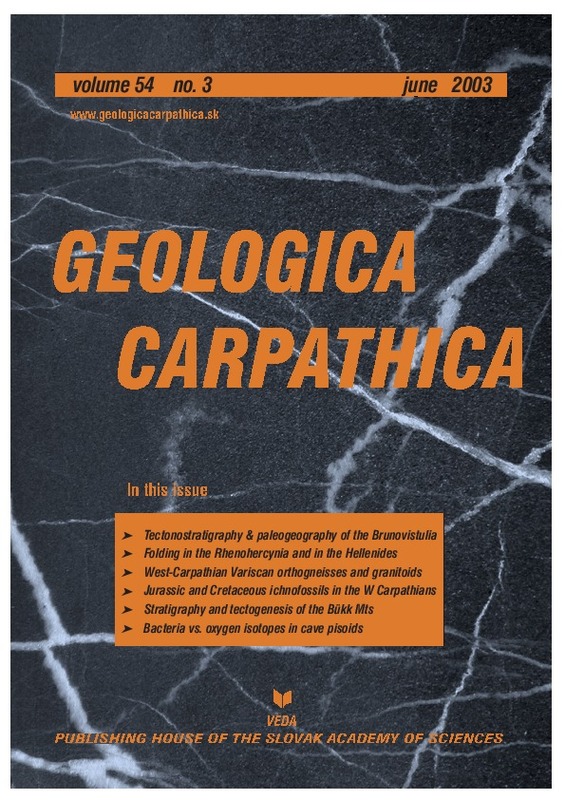 Abstract: The Variscan high-grade crystalline basement of the Western Carpathians contains granitic to granodioritic bodies transformed to various degrees into orthogneisses. The orthogneisses resemble the structures of the host regional-metamorphic rocks, indicating their syn-collisional evolution, predating the intrusion of the granitoids around 360–340 Ma. The Nizke Tatry Mountains orthogneiss, dated at ~381 Ma (NTJ-1 sample), emplaced during early partial melting stage deformation regime. Syn-tectonic magmatic flow and emplacement is suggested by the relics of magmatic foliations and lineations. Post-intrusion evolution comprises metamorphic/ductile medium-temperature fabrics of quartz, feldspars and micas, as well as metamorphic garnet growth. The granite-tonalite plutons emplaced between ~353 Ma (Mala Fatra Mountains) and ~343 Ma (Nizke Tatry Mountains, DUM-1 sample) during transtensive (?) deformation of the host metamorphic complex, show distinct magmatic fabric anisotropy, especially in their marginal parts, coeval with ductile fabrics of the orthogneisses. Petrologically the orthogneisses point to S-type granite or granodiorite, while the tonalites of large granitoid plutons seem to be of igneous I-type origin. Abstract: The common marine trace fossil Chondrites occurs in thin layers in laminated micrites which fill deep submarine cavities in peri-reefal biocalcarenites and calcirudites of the Tithonian-Berriasian Stramberg Limestone. The cavity fills display several generations which originated during long periods of time. Periodic colonization of this very stressful environment by the Chondrites trace maker was possible probably owing to episodic deposition of more oxygenated and more nutritious sediment at a certain stage of development of the cavities related to increased tectonic activity during the Berriasian. In more bioturbated laminae ?Palaeophycus also occurs. The occurrence of Chondrites in fillings of deep cavities represents new evidence for adaptation of its trace maker to stressful environments. Abstract: The Kisfennsik Nappe is the uppermost tectonic unit of the Bükk Mountains (NE Hungary). The nappe consists of slightly metamorphosed platform limestones with dolomites at the base, and intercalating metavolcanites. On the basis of lithological character and macrofossils (Megalodontidae and Gastropoda) of uncertain age, the Kisfennsik Limestone was considered to be Ladinian–Carnian or Norian. The earlier and the here published results of microfacies investigations and Foraminifera and Dasycladaceae assemblage prove a Carnian lagoonal depositional environment, for the greater part of the Kisfennsik Limestone. In an eastern site (Galya-tető) reef facies was determined. Metavolcanites show different petrographic characters: acidic pyroclastics, andesitic lavas and basic tuffs, amygdaloidal basalts are present. Acidic-transitional metavolcanites appear at different stratigraphic horizons, below and above the basic ones. Based on stratigraphic position and petrographic features, the basic ones can be correlated with the Carnian extensional magmatism of the Bükk area (Szinva Metabasalt Formation). Considering the lithological features (presence of Triassic volcanites) of the Kisfennsik Nappe, and the structural pattern of the larger area, its W-Carpathian Silicic Unit origin can be excluded. The above mentioned features support an intra-Bükkian origin. Abstract: The origin of recently growing irregular cave pisoids in Perlova Cave (Velka Fatra Mts, Slovakia) seems to be due to the activity of hydrogen-oxidizing bacteria. Several samples of water and freshly deposited calcite from cave pisoids were analysed for stable oxygen isotope ratios. The obtained values were checked using the O’Neil equation. Almost all the calcite samples display values more positive than their calculated counterparts. This phenomenon is ascribed to a fractionation process mediated by bacteria. The light isotope of oxygen is preferentially taken up by the hydrogen-oxidizing bacteria. It causes the relative enrichment in the heavy isotope in the bacterias’ surroundings, which is recorded in the calcite precipitated around the bacterial cells.